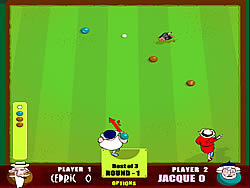 The starting player throws a small white jack. The jack must exceed the dotted line, Once the jack is successfully thrown, the same player throws 2 consecutive bowls. When thrown, the opposition throws 2 bowls. The aim of the game is to get your bowls closer to the jack than the opposition.